Have some high-spirited fun in your kitchen as you season your dishes with these ghostly salt and pepper shakers. More adorable than frightening, the handcrafted shakers are formed in playful, blob-like shapes with two-hole (salt) or three-hole (pepper) openings that evoke wide-eyed, childlike faces. The refilling holes with their cork stoppers are oddly placed on the side or top, giving the little ghosts a comic, accident-prone look. Made in Quebec, Canada by Kwok Wai Lau. A fan of the British sense of humor, Scottish rainy days, and Montreal's beauty, Kwok Wai Lau seeks to make accessories for the home that encapsulate all three. Whether its his eccentric drain pipe porcelain vase, or drinking mugs that come dressed in their very own sweater-like cozies, Lau injects his designs with unusual characteristics, UK charm, and lots of creativity, all while being quite practical. Dishwasher safe, handle with care. 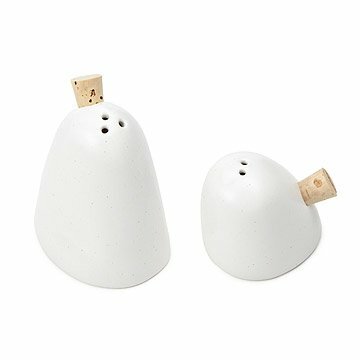 These handcrafted ceramic salt and pepper shakers have a playfully ghost-like appearance.